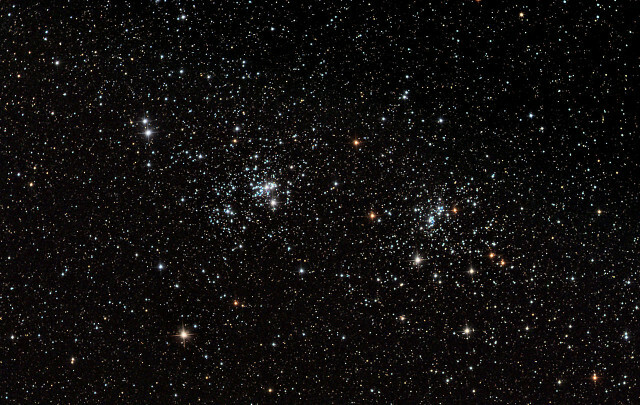 The Double Cluster, or Caldwell 14, is the name for two open clusters – NGC 869 and NGC 884 – located close together in Perseus constellation. Also known as h Persei and χ Persei (h and Chi Persei), the clusters both lie at an approximate distance of 7,600 light years from Earth and are about 12.8 million years old. 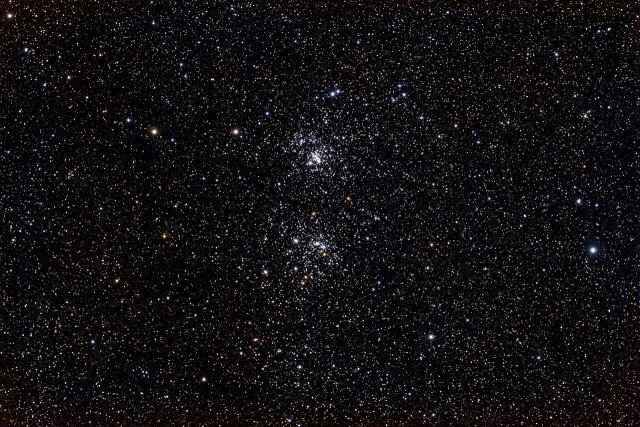 With an apparent magnitude of 3.7/3.8, the Double Cluster is visible even without binoculars in good conditions, but best observed with binoculars or small telescopes. 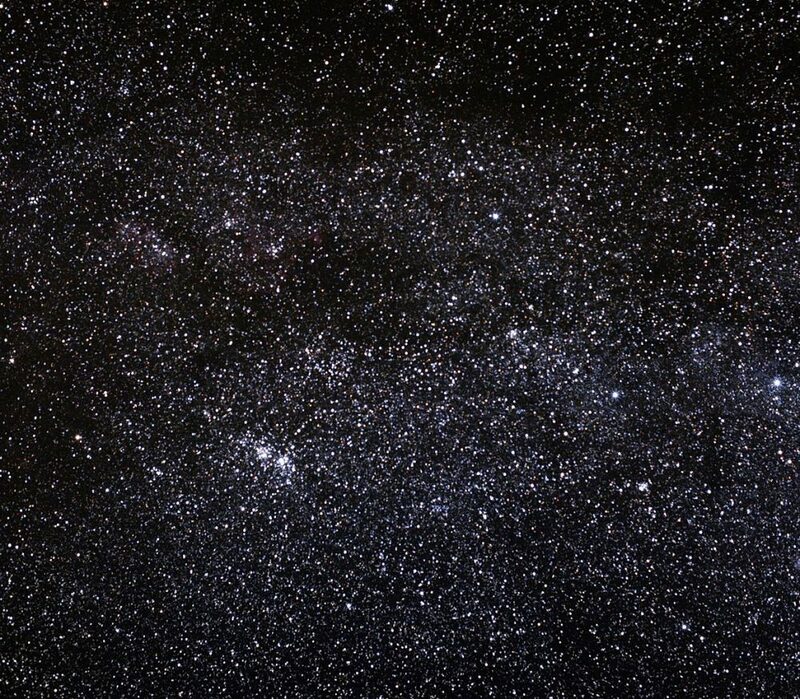 It is easy to find in the sky because it lies just to the east of the familiar W shape of Cassiopeia constellation, between the stars Ruchbah (Delta Cassiopeiae) in Cassiopeia and Miram (Eta Persei), which marks the pointed top of Perseus. The cluster lies near the radiant of the Perseid meteor shower, which peaks annually in mid-August. It is circumpolar from most northern locations. 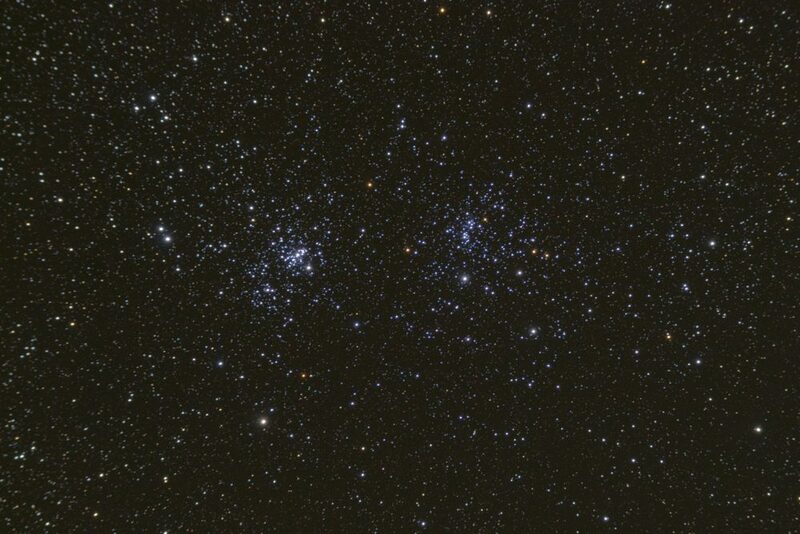 The Double Cluster occupies a total area of 60 arc minutes of apparent sky, which is twice the size of a full Moon. Individually, the clusters have a mass of 3,700 solar masses (NGC 869) and 2,800 solar masses (NGC 884), but as each cluster is surrounded by an extended halo of stars, the total mass of the Double Cluster is at least 20,000 solar masses. The two clusters are separated by only hundreds of light years. 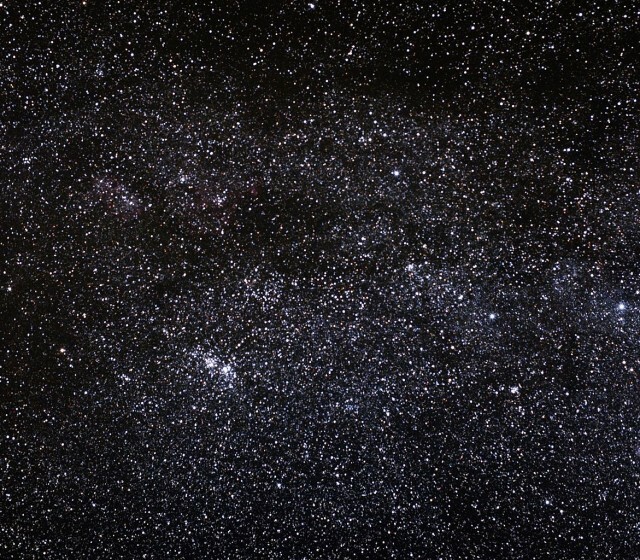 Each cluster contains 300 to 400 stars and the brightest stars shine at 7th magnitude. The westernmost cluster, NGC 869, appears slightly brighter, richer and more compact than NGC 884. At the age of 12.8 million years, the clusters are relatively young. In comparison, the Pleiades cluster (Messier 45) has an estimated age between 75 and 150 million years. If the Double Cluster were as close to us as the Pleiades (444 light years), it would occupy a quarter of the northern sky and contain some of the brightest stars visible from Earth. Each cluster contains more than 300 blue-white supergiants and their hottest stars on the main sequence belong to the spectral class B0. Both clusters contain a significant number of bright, young O and B-type stars. Both clusters are blueshifted: NGC 869 is approaching us at a speed of 39 km/s, while NGC 884 is moving in Earth’s direction at 38 km/s. The clusters were likely formed in the same star forming cloud in the Perseus Arm of the Milky Way and both belong to the Perseus OB1 association, a group of extremely massive stars. 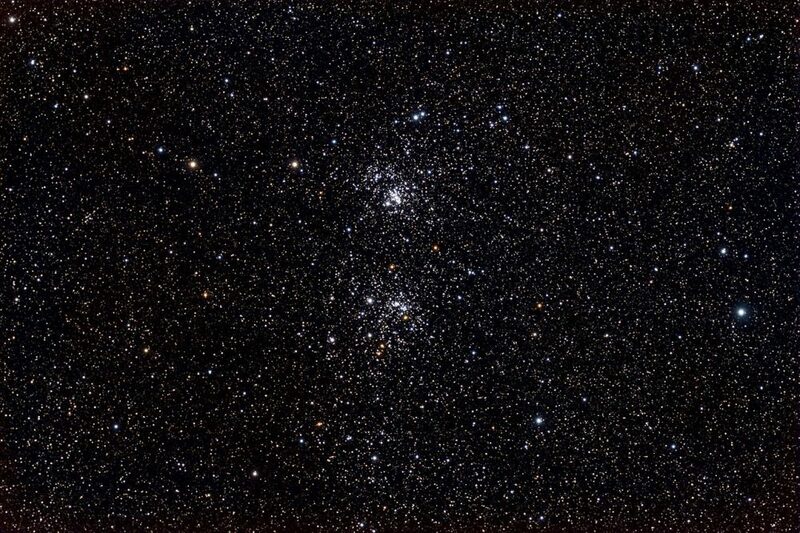 The Double Cluster has been known since ancient times, but first catalogued only around 130 BC, when the Greek astronomer Hipparchos mentioned it as a “nebula” or “cloudy spot” in his writings. 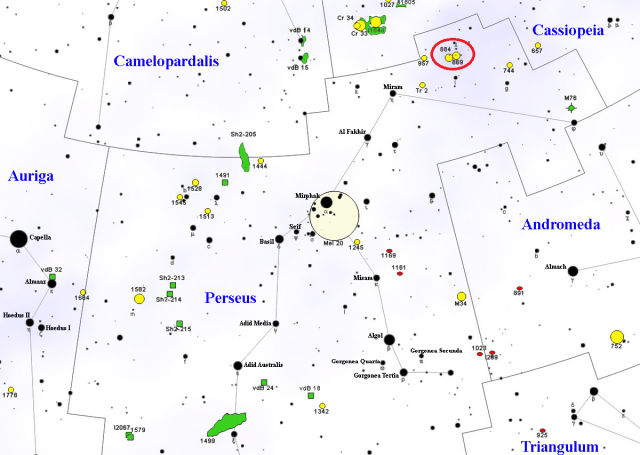 Ptolemy listed the cluster as of the seven “nebulosities” in his Almagest. It was not until much later that the cluster’s true nature was recognized, after the invention of the telescope in the early 17th century. 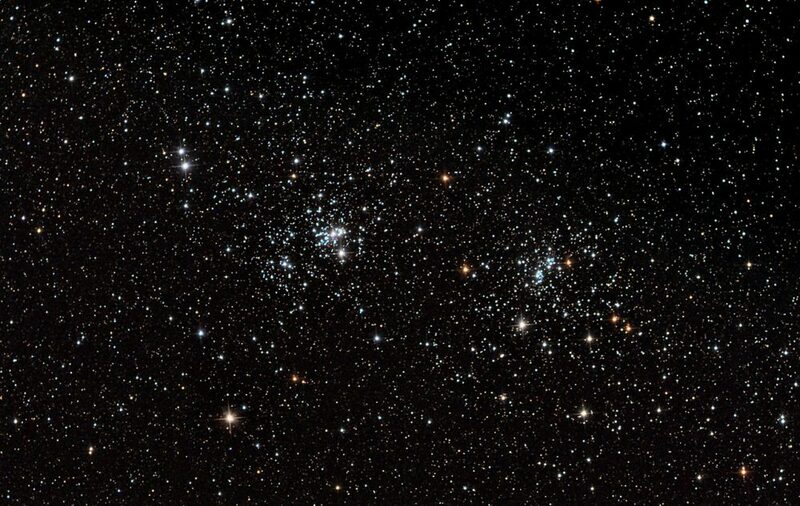 Charles Messier did not include the cluster in his catalogue, but it is listed in the Caldwell catalogue of deep sky objects not included in the Messier catalogue. German-British astronomer William Herschel was the first to recognize that the object in fact consisted of two separate clusters. In mythology, the Double Cluster represents the jewelled handle of Perseus’ sword, given to the hero by the gods, along with a shield and a helmet, to help him in his challenges. 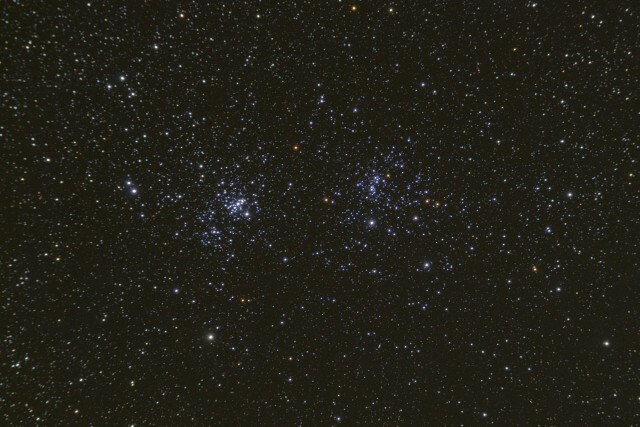 Another cluster, NGC 957, is visible in the vicinity of the Double Cluster. The smaller open cluster is similar in age and distance from Earth to its larger neighbour and possibly shares the same origin.